Security is one of the most vital elements of any office or other business location. It’s critical for businesses to be able to deter theft and vandalism, which can have a devastating impact on their bottom line. That’s why ensuring that your locks are safe and secure should always be a top priority. One of the first things you should do when protecting your business is to contact a reputable key and lock service. Every area of your business needs to be secure; from the front door, to the offices inside the building itself. For many, security is a greater concern than ever before, especially since thieves and vandals are employing ever more sophisticated breaking-and-entering tactics. One of the more well-known ways that trespassers get onto private property is through the practice of lock bumping. This article will seek to inform you as to what lock bumping is, and what steps a good home or office locksmith can take to avoid it. Before we can explain exactly what lock bumping is, we’ll need to discuss how exactly locks work. Of course, not all locks are the same, and some are much more secure than others. Most standard locks utilize the pin tumbler mechanism; an ancient, and very simple way of keeping locks locked without the proper key. The lock itself is surrounded by a casing of steel or some other strong metal; inside of the casing is what is known as a plug. On one end of the key is a keyway, where the key is inserted into the plug. The plug itself has a number of holes in it (usually five or six) and inside of these holes there are key pins. The key pins are round bits of metal of various lengths; the different lengths means that they will not align without the proper key. When the correct key is inserted, the pins will line up, pushing another set of spring-loaded pins known as driver pins upward. Once the key pins and driver pins are aligned and pushed upward by the correct key, they will no longer prevent the plug from rotating. As you turn your key, the plug turns with it, retracting the bolt and unlocking your door. This method is used on most locks in homes or offices and is effective, safe, and secure. However, many pin tumbler locks are vulnerable to a tactic known as lock bumping. Lock bumping is one of several ways to gain access to a pin tumbler lock. Unlike other methods of lock picking, it doesn’t require much in the way of special equipment. However, lock bumpers do require a special type of key to gain access to pin tumbler locks; specifically a type of key known as a bump key. Bump keys are simply keys that, instead of having teeth like ordinary keys, have a serrated pattern of peaks and valleys that can align with the pins of a pin tumbler lock. These types of keys can be purchased, or they can simply be made by filling down the teeth on an ordinary key. Lock bumping, utilized by professional home and office locksmiths for years, has also become popular among burglars due to its speed and ease of use. A lock bumper will usually carry several sizes of bump key; with them, they’ll be able to access many different locks. The process for lock bumping is simple, however the bump key must be the correct size for the particular lock it’s being used to pick. Too large or too small of a bump key and the process will not be effective. Lock bumping is also noisy, as it requires actually physically “bumping” the key in a loud way in order to effectively gain access to a business or residence. A spring is slid onto the bump key, which is then partially inserted into the keyway and turned slightly. Of course, the pins will not align and so the cylinder will not begin to rotate. However, the back of the bump key is then tapped repeatedly with a blunt object of some kind. In this way, the key pins are forcefully pushed upward. As they are spring loaded, they’ll quickly pop back down, but if the pins are aligned just right and the key is turned quickly enough, the cylinder will turn, the bolt will slide back, and the lock will be opened. While the process might take a few tries for the bumper, this will allow most locks to be accessed fairly easily. In fact, the more expensive and high-quality the lock, the more easily it may be bumped, unless the proper countermeasures are taken. While lock bumping can be used by a professional office locksmith to help you gain access to your building when you’ve forgotten your key, it can also be utilized by criminals and so you need to take proper security measures. You should ask your local locksmith what they offer in the way of tamper-proof locks. 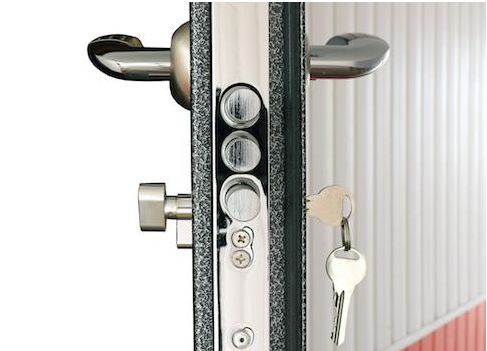 Many locks feature anti-bump features; they are often fairly simple in and of themselves. Many of them make use of additional pins; the more pins in the cylinder there are, the harder the key will be to bump. They can also make use of specially made keys of unusual shapes and sizes; it will be more difficult for a criminal to access a lock if they don’t have the proper key blank. While most locks can be still be accessed in some way, the idea is to make your lock too difficult and inconvenient for a vandal or thief to get into. Frustrated, they’ll leave and your home or business will remain safe and secure. Contact a reputable office locksmith and ask them about anti-bump and tamper proof locks. They’ll be able to make recommendations for you as to what type of lock will be most secure for your place of business. If you are in the Vancouver, Washington area, we recommend Harry’s Locksmith. They will be able to bring decades of experience with locks of all kinds to help keep your place of business secure.